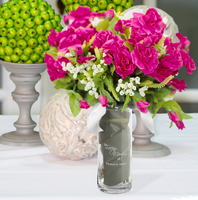 Our personalized Garden of Memories Memorial Vase pays tribute to loved ones who have passed away but live on in our hearts. An ideal way to remember that special someone during a wedding or other notable occasion, the vase includes an attractive laser etched "In Loving Memory of" and featuring the name of the deceased. Vase measures 7 1/8" x 2 1/2" and holds 20 ounces. Personalize with up to three names of up to 20 characters per line. Be creative include 3 names or 1 name, dates and place. Great for remembrance at Wedding, Engagement event or as a decorative piece every day.